It is against in Facebook community standards to create a fake profile and page of real people or business. If someone created an account that are trying to imitate someone that you know and you are sure that it’s not a real account, you can easily report this to Facebook. 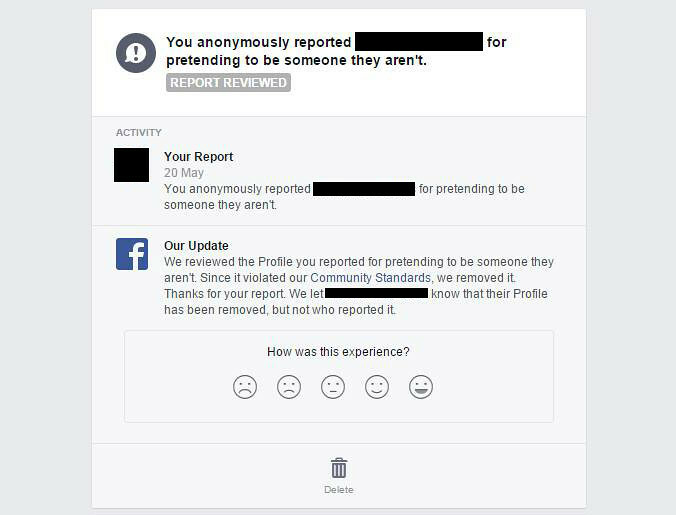 If you are hesitant to report because you are fearing that the impostor might know you, Facebook will never disclose who reported the fake account. They will only review the reported account and if it is proven that violating their community standards they will immediately delete the account. Facebook provided two options to report a fake account, first for the person or business that has an account and the second for doesn’t have a Facebook account. 1. For the person or business that has a profile or page, simply go to the fake account and click the three dot icon (…) on their profile. And on the drop down menu, select “Report”. 2. On the pop up select, “Report this account” then click Continue. 3. On the next screen, select “This is a Fake account” then continue. 4. Next, select “Other…” then continue. 5. From here you can submit the page for Facebook to review, you can also block the page or account. For the person or business that has no Facebook account, they’ll need to fill up this form. And please take note that according to Facebook they will only act to the report from the person who’s being impersonated. This means that if you’re not the person that has been impersonated you cannot report the fake account unless you are authorized, but you can contact the person and ask them to fill up the form, I’m sure you know them. To fill up the form, select which describe your situation and follow the next step, the form will depend on your previous input just follow the on screen instruction. After reporting the fake account, all you have to do is wait for the confirmation from Facebook either the account has been removed or not. 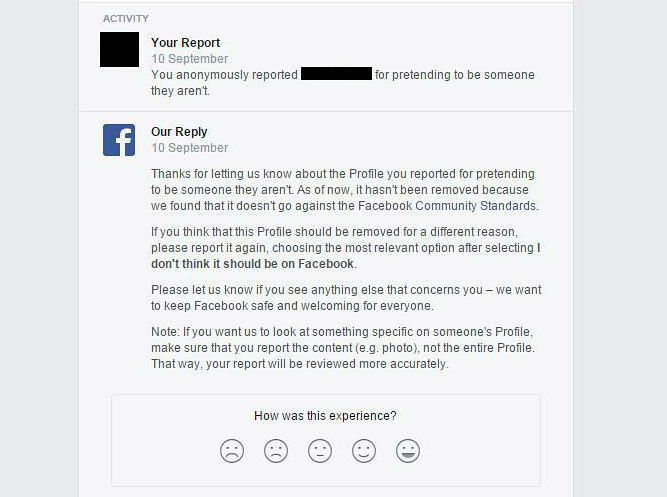 You will receive a message like on the screenshot below if the account you reported violated the Facebook community standard and successfully removed. 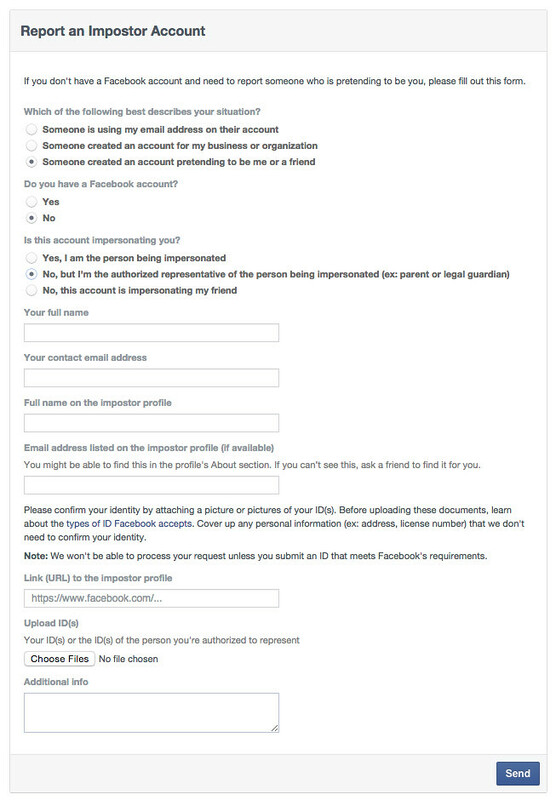 And this is what you will receive if the account is not violating Facebook standard and your report doesn’t approve.